These Chocolate Fondants are absolutely gorgeous! A chocolate cake case, filled with hot, silky chocolate sauce. One is not enough! Serve with Vanilla ice cream or a quenelle of whipped vanilla cream. Serves 6. Lightly coat 6 metal ramekins with the melted butter and chill in the freezer for 5 minutes. Give the ramekins a second coat of melted butter and sprinkle the insides with the cocoa and sugar mixture. Preheat the oven to 200C°/Gas mark 6 and put a baking sheet in the oven. Melt the butter and chocolate in a bowl set over a pan of simmering water. Whisk the eggs and the 150g of sugar together for a minute or two in a bowl, until it is light, fluffy, and slightly thickened. Now add the flour and whisk into the mixture. Finally gently whisk in the melted chocolate mixture until it is incorporated evenly. Pour into the prepared ramekins, filling them tw0-thirds full, and put them on the heated baking sheet. Bake in the oven for 8-10 minutes, the mixture should rise, with the top slightly cracked like a biscuit - the centres should still be runny. 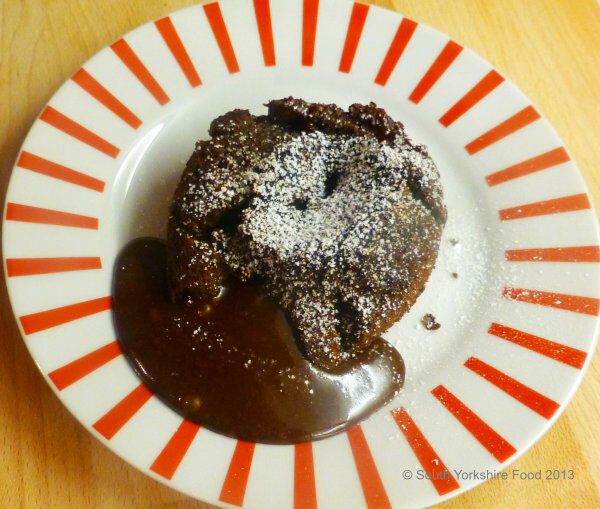 Leave the chocolate fondants to rest for a minute or so before serving. Ease around the inside of each ramekin with a sharp knife to loosen the fondant, and carefully tip onto a serving plate.